Craft beer has exploded in popularity in recent years. But a slew of challenges are slowing the once-surging industry. President Trump's looming 10% tariff on aluminum — think beer cans — poses the latest threat. Brewers say the trade action will hurt a niche business that has created tens of thousands of jobs. "It certainly puts a strain on the business," says Chad Melis, marketing director at Oskar Blues, a Colorado-based brewery with operations in North Carolina and Texas. "It will affect our ability to grow and create new jobs and invest in our communities." When Melis started at the brewery 10 years ago, it employed five people. Today it employs 285. 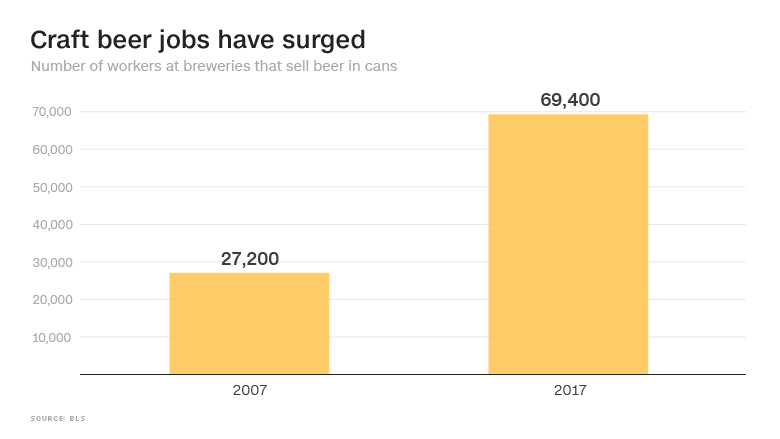 Across the country, 69,000 people worked at breweries that sell beer in a can as of last year, up from 27,000 a decade earlier, according to Labor Department statistics. All craft breweries contributed $68 billion to the US economy in 2016, according to Bart Watson, chief economist at the Brewers Association, an industry group. 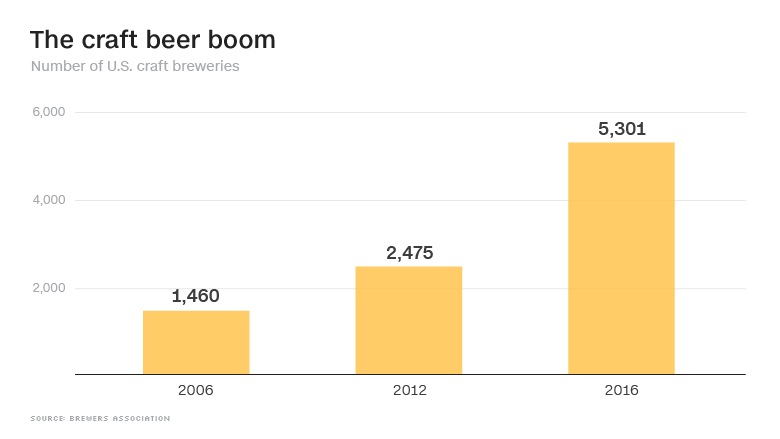 There were 5,300 breweries that year, up from 1,500 in 2006. Brewers say the tariff couldn't come at a worse time. Competition is already at an all-time high, making it difficult for breweries to raise prices. Sales growth has slowed. The cost of hops has soared as a result of the beer boom and a limited supply. And large beer brands, such as Budweiser, are scooping up craft breweries. With more financial muscle, the Budweiser-owned brands can more easily weather the extra cost of Trump's tariff and keep prices low for customers. The aluminum tariff would hurt Melis' brewery. Oskar Blues cans 65% to 70% of the 200,000 barrels of beer it makes every year. A barrel is the size of roughly two traditional kegs. Melis estimates that the tariff would cost the business $400,000 more per year. Commerce Secretary Wilbur Ross argues that the tariffs won't raise customer prices much, adding it's "no big deal." 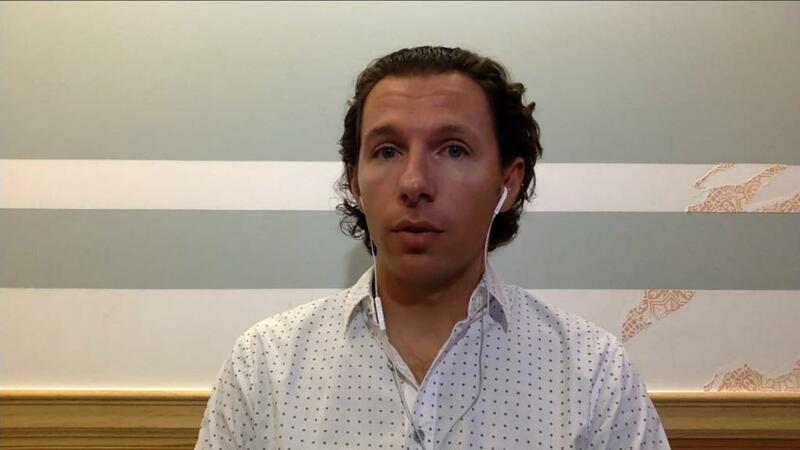 For Melis, the increased cost is equal to about 1% of his revenue last year. But he says it will be difficult to swallow increased production costs as competition ramps up. "It's a significant amount," says Melis, who sells beer in cans, in kegs for bars and at his breweries. He says he will try not to raise prices on customers. But he says, "It's a tough time to introduce the increase of cost of goods." Beer cans have surpassed bottles in recent years. Brewers like cans because they're cheaper, they're easier to recycle, and a truck can carry more cans than bottles. Cans have also become canvasses for eclectic designs, providing more space than a bottle label. For the Bronx Brewery, cans account for half the company's packaging costs. An additional 10% tariff won't help the budding brewery, which only sells in cans, according to its founder, Damian Brown. He and a friend started Bronx Brewery in 2011. Today they have 17 full-time employees, several part-timers and a 10,000-square-foot brewery. Brown says he has no immediate plans to raise prices or lay off workers. But if costs continue going up, he says, "eventually, everything translates into head count." 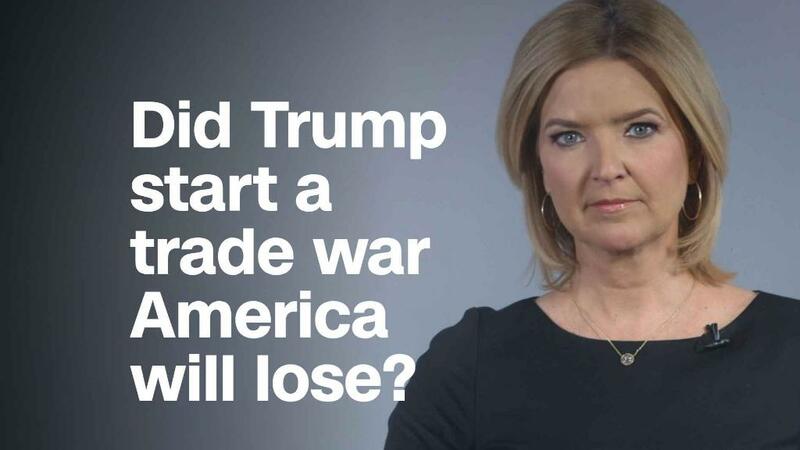 Brown, 37, is particularly irked by Trump's rationale for the tariffs. The president says that aluminum imported from all other countries, some of which is used to make beer cans, poses a risk to US national security. "It's laughable," says Brown, who adds that the cost increase would be significant. "You'd be hard-pressed to make the case that canned sheet aluminum of that stock used to make beverage cans is in any way, shape or form a risk to national security." The tariffs would also be a major hit to Fullsteam Brewery in Durham, North Carolina. Its pitch to customers is that it brews beer with North Carolina ingredients, from barley to spice bush to goldenrod. They're not cheap, nor is the local malter who turns raw barley into a beer ingredient. Sean Wilson, Fullsteam's founder, says the tariff would be a significant cost increase for his brewery, which employs 26 people full-time and about as many part-time. Wilson says Fullsteam has no plans to lay off workers. If aluminum becomes more expensive, he will try to attract more customers to the brewery's tap room so he can spend less on cans. If costs go up too much, he says he would have to consider layoffs at some point. Fullsteam employees earn about $14 an hour, which is above the living wage of $11 in the state. Wilson also says the tariff would force him to consider buying grains from more industrial-size farmers instead of mom-and-pop farms in North Carolina. The tariff would chip away at "why we exist. ... It's worrisome, it's burdensome" Wilson says. "I worry about our ability to support the local farmer."